Walk along Via del Corso in Italy and you’ll find yourself on the main street of Rome. Fitting, then, that Italian-inspired gelato bar and patisserie Via Del Corso can be found in the pumping heart of Sydney. 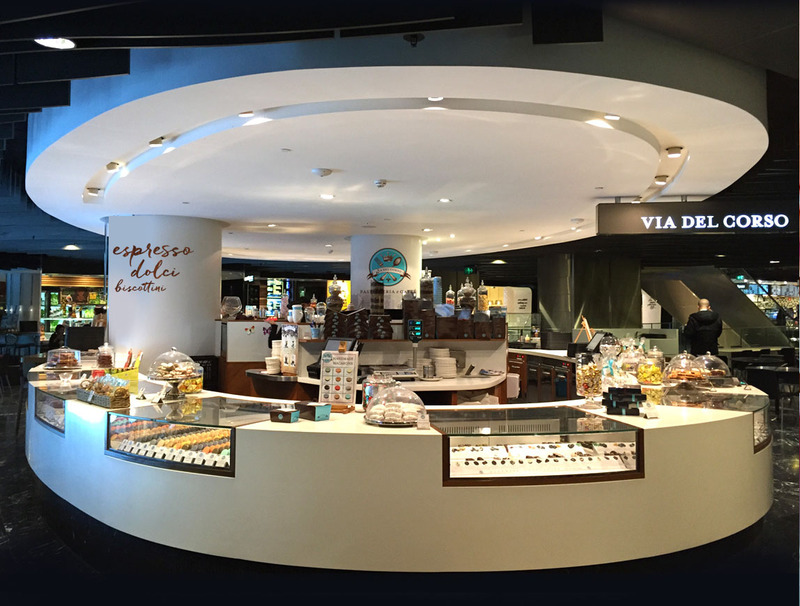 Westfield Sydney has become a saving grace for city workers who left their lunch at home or completely forgot to buy their mum a birthday present (and they’re seeing her tonight!). For the former, they travel to Level 5 from Market Street via the escalators, skit right around that odd-shaped sweet shop in the middle and make a beeline for the likes of Guzman Y Gomez, Spuds n Crepes and Snag Stand. Herein lies their mistake, because that odd-shaped sweet shop is none other than Via Del Corso. Over the past six years it has sat, understated and largely unnoticed, while literally thousands walked right on by every day. But that’s all about to change, thanks to a revamp that’s sure to catch your eye, then your mouth. The original Italian-imported woodwork and bench has remained, but fancy brass signs have been erected, and so has a new menu. Owner Alessandro Fuscaldo has tried and tested almost everything in his 30-year career in the hospitality industry, and has now reached a pinnacle with Italian food, service and coffee. Handcrafted chocolates by an expert chocolatier, coffees boasting the true flavour of Italian espresso, and a whooping 42 flavours of gelato are ready and waiting to be ordered. The hot (or should that be cold?) gelato favourite is tiramisu, even flagged by those who don’t like tiramisu in its traditional form. Along the Italian pastry lines are cannoli and zuccherati that are as big as your face, and if you’re in the mood for something French, the macarons are the perfect consistency: crisp on the first bite, then, as your teeth sink further in, a somewhat hard soft layer leads you to the creamy filling. Among the usual (Nutella and salted caramel, peanut butter, pistachio), some of the flavours may seem a tad unbelievable (buttery choc-chip or jasmine matcha, anyone? ), but in this case, eating is believing. Oh, and they’re not kidding when they say the baked ricotta cheesecake is ‘not to be missed’. As your fork enters the fluffy filling, you’ll hear the most divine sound, it’s as though you’re pronging a moist (sorry, dear reader, we hate the word too, but there’s just no other way to describe it) cloud. Our tip: take small mouthfuls, so as to appreciate every morsel.